In my post yesterday, I discussed the seemingly incongruent fact: the more frequent heat waves, the fewer the number of people who die from them. This results from adaptive measures that the people who live in hot places incorporate into their lifestyles. These adaptations include access to air-conditioning which is facilitated by the availability of cheap, reliable, and abundant electricity. Today, I’ll look more in detail at a new paper which projects a rapid rise in human mortality across Europe to accompany projections of rising temperatures there—contrary to observations. For starters, the new study by Joan Ballester and colleagues makes a rather large error in developing the temperature-mortality relationships across Europe. They assume that since there is a close correlation between daily temperatures and daily mortality across the year, that daily mortality must be caused by daily temperature. In doing so, they fall into the old “correlation does not imply causation” trap. This is an easy trap to fall into in this case because there is a seasonality to human mortality—more people die in the winter than in the summer. Thus it seems logical to conclude that there is a strong temperature component to human mortality which suggests that cold kills more people than heat. But such logic will get you in trouble and lead to incorrect suppositions and results—as it has in the case of Ballester et al. study. Ballester et al. assume that cold temperatures on a daily timeframe lead to a large signal in the daily mortality numbers. But this is largely untrue—with the exception of very rare extreme cold outbreaks. You wouldn’t necessarily know this by plotting up daily temperatures vs. daily mortality—which is what Ballester et al. do. 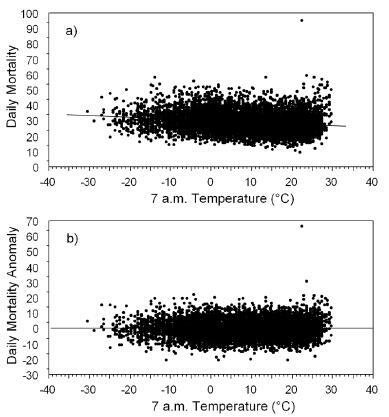 For example, Figure 2 is taken from their paper and apparently shows a strong relationship between daily temperature and daily mortality. This roughly U-shaped relationship suggests that lower temperatures lead to elevated mortality and higher temperature lead to elevated mortality, with a minimum somewhere in the middle. And Ballester et al. model this apparent relationship for locations across Europe. Then, using temperature projections from the 21st century produced by climate models run with increasing greenhouse gas concentrations, they produce mortality projections under for the future climate conditions. Figure 2. 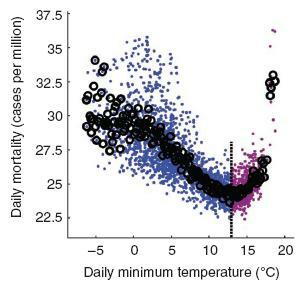 Observed relationship between daily temperatures and numbers of deaths in Europe (source: Ballester et al., 2011). But like I said, the relationship that they are observing is incorrectly captured by their statistical model. In fact, daily temperature only detectably influences daily mortality on a few of the hottest days of the year in some places. And the impact of even monthly temperatures is debatable. In another study from the same research group I was involved with which was doing temperature-related mortality research (being led by Dr. Robert Davis from the University of Virginia) we set out to examine the seasonality of temperature/mortality relationships. What we found was that the U-shaped relationship between daily temperatures and daily mortality illustrated in Figure 2, largely disappeared when daily temperatures were plotted against daily mortality anomalies. Figure 3 shows our results for an example city (in this case Kansas City). Due to scale considerations, the original U-shape (the top panel in Figure 3) that you get when you plot daily temperature against daily mortality doesn’t appear as distinct as in Figure 2, but it is still present and strong. But when we plot daily temperatures against daily mortality anomalies (bottom panel in Figure 3), all sense of a relationship disappears with the exception of the very hottest days. In other words, the time of the year is far more important at driving daily mortality than is the actual temperature. Figure 3. (a) Population-adjusted daily mortality vs 07:00 h local standard time (LST) temperature (°C) for the Kansas City metropolitan statistical area (MSA). A linear regression line is superimposed. (b) Same as in (a) but for de-seasoned, population-adjusted daily mortality (source: Davis et al., 2004). Now you might say, well aren’t the two (temperature and season) closely related? Well, yes and no. In the Northern Hemisphere, it is colder in the winter than it is in the summer, but it is not always the case that the temperature is dangerously cold in the winter or dangerously hot in the summer. A good example of this is to consider the mortality seasonality observed in Detroit, Michigan with that in, say, Miami, Florida (Figure 4). In both cases, the seasonally amplitude of mortality is similar—about 3 more people die on an average winter day than on an average summer day in both locations. But, the average winter morning temperature in Miami is not that dissimilar from the average summer morning temperature in Detroit. In fact, the average low temperature during the winter in Miami is about 65°F (18.5°C)—not all that different from what many folks set their thermostats to in the winter. The cold is not killing people in Miami. Figure 4. 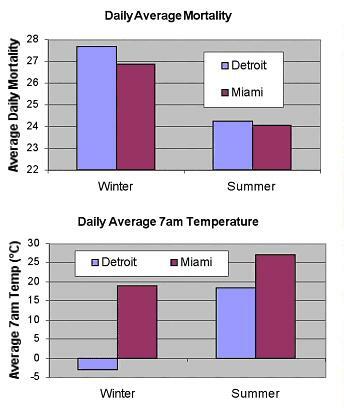 (top) Average standardized daily mortality (per million people) during the winter (December-February) and during the summer (June-August) for the cities of Detroit and Miami. (bottom) Average daily 7am temperature during the winter and summer for the same locations (data from Davis et al., 2004). Or if the climate itself warms. So, the commonly-held belief, that since more people die in the winter than in the summer, climate warming will lead to fewer deaths, is by and large a myth—born from an improper analysis and understanding of the data. And it is this myth that is perpetuated by the analysis of Ballester et al. and the reporting of Seth Borenstein. But Ballester and Borenstein even take it one step further by claiming that this (largely false) “benefit” of global warming will, within a few decades, be eclipsed as heat-related deaths increase faster than cold-related deaths decline under a typical global warming scenario. Sorry guys, but two wrongs don’t make a right. You are wrong about rising temperatures making a significant dent in cold-related deaths and you are wrong about rising temperatures leading to a sustained rise in heat-related deaths. To be fair, the Ballester team actually does perform an analysis which examines the sensitivity of their results to varying scenarios of adaptation. What they find, is that under the assumption that people quickly adapt to rising temperature, the future temperature-related mortality declines as the climate warms (just like I said). However, Ballester et al. are quick to dismiss this result as entirely improbable as they discount the probability that human populations can adapt at the pace necessary to keep up with the rising temperatures. Interestingly, in their list of citations, they include neither Palaecki et al. (the Chicago study) nor Fouillet et al. (the France study) which clearly demonstrate a high level of adaptation occurring with the period of only a few years. That is, until it kills you. To avoid such a fate, my suggestion it to adapt to the ever-changing world around you. For the case of dealing with rising temperatures across Europe, I would think that increasing the availability of air-conditioning would be a good place to start. I imagine that more Europeans would be more open to this solution if only the price of electricity weren’t so darn high. People don’t really die in high number from the cold. It is heat that really gets you. But avoiding the heat (at least to the degree necessary to avoid dying), is fairly straightforward (and made easier by access to cheap and reliable electricity). And the more you face the heat, the better prepared you become, and the less your chance of dying. So, if global warming pushes the thermometer up, it should push mortality down. That doesn’t sound like such a bad outcome–let’s hope the do-gooders (like the EPA and folks advocating for greenhouse gas emissions controls) don’t mess things up. Davis, R. E., P. C. Knappenberger, P. J. Michaels, and W. M. Novicoff, 2004. Seasonality of climate-human mortality relationships un US cities and impacts of climate change. Climate Research, 26, 61-76. Palecki, M.A., S.A. Changnon, and K.E. Kunkel, 2001. The nature and impacts of the July 1999 heat wave in the midwestern United States: Learning from the lessons of 1995, Bulletin of the American Meteorological Society, 82, 1353–1367. The Ballester paper is a curious thing. It’s as if she and her colleagues never read Darrell Huff’s classic, How to Lie with Statistics, in particular the chapters entitled The Well-Chosen Average and The Little Figures That Are Not There. Let me urge all who haven’t read this book to do so. After which, you’ll be able to expose such poorly crafted academic knitting for the pretentious frauds they are. Using Ballenger’s statistical method, one could “show” that more people die because they don’t eat a certain brand of breakfast cereal. They exaggerate the effect of cold temperatures on mortality and then fail to recognize the reality that people rapidly adapt to high temperature extremes. Not surprisingly they then decide that humanity is very vulnerable to climate. Perhaps it is a little surprising that their to mistakes don’t cancel out more, though. The bottom line is that we shouldn’t expect AGW to raise the mortality rate. It’s sunlight. Lack of it in the winter causes death from Vitamin D deficiency. Plus SAD effects from too much darkness. There, aren’t you glad I was here to explificate that for you? By your and my logic, the patterns should be reversed (by month) in the Southern Hemisphere. Got stats for Australia and Argentina and South Africa lying around anywhere?